I miss shopping soooo much! Even just window shopping. I never have the time to so when I walked past Topshop the other day I got pretty excited at some of the beautiful things in there. And because I was in a rush I didn't really get to go in. Instead I ventured online and created myself a little big wishlist of things that I would LOVE from their current collection. 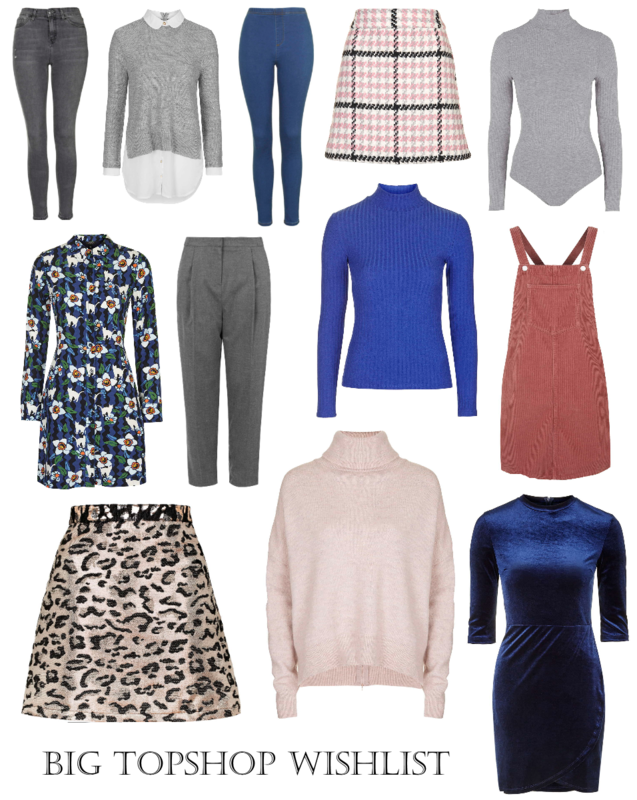 I absolutely adore what Topshop are doing at the moment with their clothing. There is so much that I like, and I want it all. I feel like this wishlist has taken a blue/pink/grey look to it with some heavy prints! I'm also really loving A-Line skirts, full sleeve high neck (but not too high) tops and I'm also digging the cord pinafore dress lots. On top of that I'm really feeling the need for some more denim leggings in my life and another shade of grey jeans/trousers. I can't actually pick what my favourite things in this wishlist are but I can say my top five are probably 6, 10, 11, 4 and 5. That velvet dress would look amazing with my matching blue velvet boots too! Do I foresee a possible NYE outfit!? Maybe. What shop are you loving lots from right now?